KAWASAKI - Kawasaki Frontale moved closer to a second straight J. League title with a 3-0 win Saturday against visiting Kashiwa Reysol. Akihiro Ienaga opened the scoring in the 21st minute after Hidemasa Morita found him inside the box with a well-executed cross. The midfielder sent a left-footed shot into the top right corner past ‘keeper Kosuke Nakamura for the early lead. Shogo Taniguchi followed up 12 minutes later at Todoroki Stadium, outjumping Kenya forward Michael Olunga to head in a corner kick from Kengo Nakamura. Reysol had a chance to halve the deficit in the 37th minute, but a shot from Junya Ito hit the left post. The league leaders continued to dominate after the break, with Hiroyuki Abe jumping on a deflected save to seal the win. 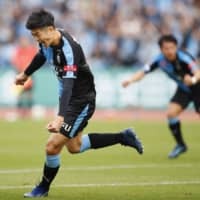 Frontale sit on 63 points at the top of the table, seven points ahead of Sanfrecce Hiroshima in the 18-team first division with three league games left in the season. They can secure their second straight and second overall league title with a win against eighth-place Cerezo Osaka next Saturday. In other first-division matches, visiting FC Tokyo beat Yokohama F. Marinos 1-0 at Nissan Stadium courtesy of a winner from Jang Hyun-soo. FC Tokyo improved to 49 points, tying the Kashima Antlers in the race to next year’s Asian Champions League. At Yamaha Stadium, Kogi Ogawa’s penalty time goal lifted Jubilo Iwata to a 3-2 win against Sanfrecce, who suffered their fourth straight loss. At Toyota Stadium, a brace from former Germany international Lukas Podolski pushed Vissel Kobe 2-1 over Nagoya Grampus, who are one point outside the relegation zone in 15th place.